For safe snowmobile operation, it is important to know something about the basic snowmobile controls and instruments and what they actually do for you. This understanding will help you safely get the most enjoyment and performance out of your sled and help in the event repairs along the trail become necessary. Your sled’s controls and instruments are located on the handlebars, the hood, and the chassis in front of the operator. Some control and instrument locations are standardized from manufacturer to manufacturer and some are not. Ignition Switch – This multi-position key activated switch is located near the steering column and prevents the snowmobile from starting without a key being present. The key is turned to the on position and left when the manual starter is to be activated. It has an additional start position when the snowmobile is equipped with an electric starter. After the engine starts, the switch returns to the on position. Tether – This is a special cord connecting your body to the snowmobile electrical circuit on certain models. Should you and your sled part company, the tether cord will be pulled out of the snowmobile electrical circuit stopping the engine. The snowmobile will not start without the tether plugged in correctly. Choke or Primer – The choke is a two position (full and one half) mechanical device which causes an extra rich gas mixture to flow into the carburetor for cold engine starting. On some snowmobiles there is a primer which dumps extra gas into the carburetor for extreme cold weather engine starting. Some hi-tech sleds even have electronic fuel injection. 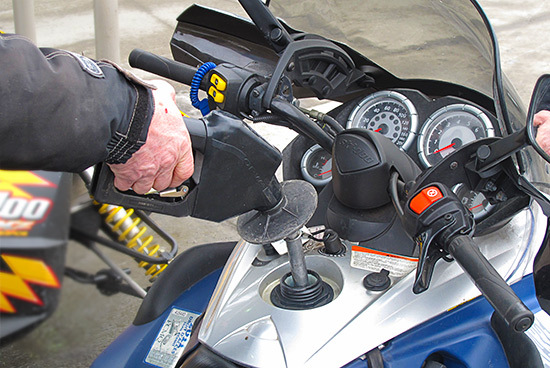 Throttle – The throttle is mounted on the right handlebar and operated by the driver’s right thumb. It controls the amount of fuel flowing to the engine and hence your ultimate speed. Emergency Stop Switch – This is commonly referred to as the “Kill Switch” and is located on the right handlebar. When pressed down it shuts off electricity to the motor causing the engine to immediately stop running. This is much faster and convenient then trying to find and operate the ignition switch in an emergency. The snowmobile can; however, continue to travel at a high rate of speed for some distance. Starter Cord – This manual starter cord is quickly and forcefully pulled to cause the engine to rotate to start the snowmobile. Reverse – The reverse control is either a mechanical device which causes the snowmobile track to turn in the opposite direction or an electronic device which stops the engine for an instant and restarts it running in the reverse direction. A word of caution when backing up. If one is in reverse and “gives it the gas” the sled may accelerate quickly in reverse tossing the rider up over the handlebars! Always promptly return the reverse control to the forward position. Brake Lever – The hydraulic or mechanical brake lever is located on the left handlebar and operated by the left hand. It applies a brake to the drive train to slow or stop the track from turning, thereby stopping the snowmobile. Headlight Switch – This switch controls the headlights high or low beams. Heater Controls – These switches control the handlebar and thumb warmers to provide varying degrees of heat to suit individual rider preference. Accessories Controls – There may also be additional controls for accessories like an electric helmet face shield warmer, seat warmer, or foot warmer. Speedometer – This mechanical or electronic instrument displays the snowmobile speed. Odometer – This mechanical or electronic instrument displays the cumulative snowmobile mileage from when the snowmobile was manufactured or a new speedometer was installed. Trip Odometer – This resettable mechanical or electronic instrument displays the snowmobile mileage from the last time it was reset. Tachometer – This mechanical or electronic instrument displays the speed at which the engine is rotating to aid in assessing snowmobile performance. Fuel Gauge – This mechanical or electronic instrument gives an approximation of the amount of fuel remaining in the fuel tank. Other Warning Lights or Gauges (temperature, gas, oil, antifreeze, etc) – These important warnings can inform the operator of special conditions which require correction for the snowmobile to be operated safely. Rear View Mirror – This mechanical device permits an operator to observe trail traffic behind the snowmobile.